China on Thursday expressed encouragement and support for the Democratic People's Republic of Korea (DPRK) and the United States to further demonstrate their sincerity, a Foreign Ministry spokesperson said. Spokesperson Hua Chunying made the remarks at a routine news briefing when answering a question related to the on-going preparations for the DPRK and U.S. leaders' meeting. According to reports, preparations for the meeting are going on in New York, Singapore and in Panmunjom. Hua said China is aware of the active preparations by the two sides for their leaders' meeting. China considers that direct contact and dialogue between the two leaders is the key to solving the Korean peninsula nuclear issue. "There is a historic opportunity for breaking years of deadlock on the peninsula and realizing denuclearization," she said. "We encourage and support the two sides to further demonstrate their sincerity with positive interaction, in order to ensure the meeting will take place on schedule and jointly open the gate of a denuclearized, peaceful and prosperous future for the peninsula." 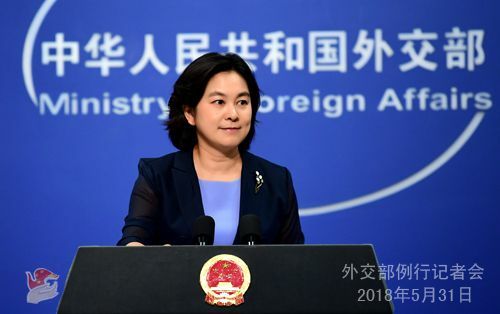 China is firmly committed to achieving the denuclearization of the Korean peninsula, and appreciates the series of positive actions taken by the DPRK this year, said Hua, adding it is necessary to give attention to and resolve the DPRK's legitimate security concerns in promoting the denuclearization of the peninsula. On media reports that Republic of Korea (ROK) President Moon Jae-in may also visit Singapore for a trilateral meeting with DPRK and U.S. leaders and together issue a declaration of the end of war, Hua said China supports the end of war at a early date, and advocates for the establishment of a lasting peace mechanism to replace the temporary armistice mechanism. "As an important party to the peninsula issue and a party to armistice agreement, China has always worked and will continue to work for this purpose," she said.